The U616 is one of three models in the new Nautilus Performance Series, joining the base U614 and top of the line U618 models. With a wide array of built in workouts, Bluetooth Smart tracking and lots of customization, it's a solid choice in the entry level category. If you're looking for an affordable exercise bike for your home gym, the U616 is definitely worth consideration. The Nautilus U616 is silver and black with two large blue backlit LCD displays with USB charging capability. It's lightweight and compact, yet offers a smooth, quiet ride. Critics really like the new Performance Series, and the U616 is currently the most popular model. it is well-priced at under $600 when it's on sale, and it has plenty of features and capabilities to keep you satisfied. The company is known for their wide variety of built in programs, and the U616 has 29 in total: a Quick Start, 4 custom, 12 profile, 9 heart rate, 2 fitness and 1 recovery. There's plenty of variety mixed into the workouts, and you can also change up your resistance manually with 25 different levels to choose from, more than you get on the base U614. The bike feels smooth and transitions are relatively seamless. You can measure your heart rate with the grips or if you have one, a wireless heart rate monitor. The DualTrack display is large and bright, and although it is a bit busy it doesn't take long to get the hang of it. It gives you all of the relevant feedback that you could want from your workout. Speaking of your workout, you can track everything via the NautilusConnect app using Bluetooth, which can be synced with MyFitnessPal as well. That way you can keep on top of your workouts, set goals for yourself and even share all of your results with your friends and family. All in all the U616 is a very good entry level upright from Nautilus, and a nice step up from the base U614 with more workouts, more resistance levels and Bluetooth, which the U614 does not currently have. 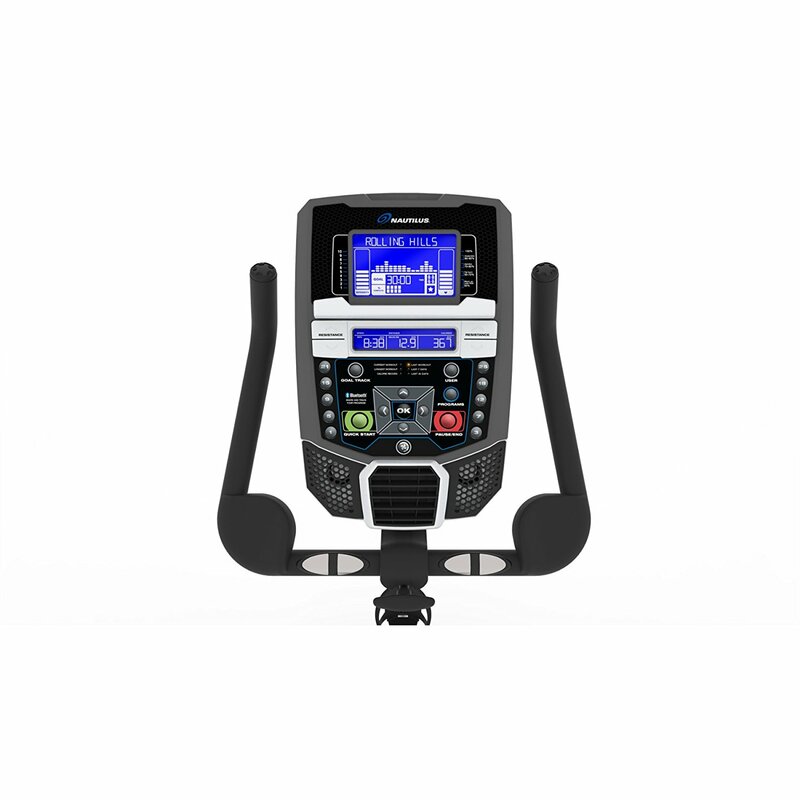 How Does the U616 Compare to the Other Nautilus Exercise Bikes? All three Nautilus bikes are affordable and packed with features, but as you move up through the lineup you just get a little more functionality. The U616 is in the middle of the pack, so it has more than the U614 offers but less than the top end U618 upright. The entry level model in the series gives you 22 workout programs, 20 resistance levels, an 18 lb. flywheel, 2 user profiles, hand grip heart rate monitoring and a 300 lb. maximum weight capacity. As you read about above, the U616 gives you more of just about everything, with 29 workout programs, 25 resistance levels, a 22 lb. flywheel, 4 user profiles and wireless heart rate monitoring. You also get Bluetooth workout tracking capability through the Ride Social and Nautilus Trainer fitness apps, a roomier seat and deluxe pedals. The jump from the U616 to the U618 isn't as big as that from the U614 to the U616, but you do get a heavier 30 lb. flywheel, a more advanced console, a large gel seat, premium handle bars and special pedals. It also comes with a heavier max weight capacity of 325 lbs., a free heart rate chest strap and the strongest warranty in the lineup. So as you can see the U616 sits right in the middle, a more advanced machine than the U614 with added Bluetooth workout tracking capability. However it's not as durable as the top of the line U618 model. Note that their recumbent counterparts, like the R616, have identical features. We really like the U616 as it gives you a lot of bang for the buck. 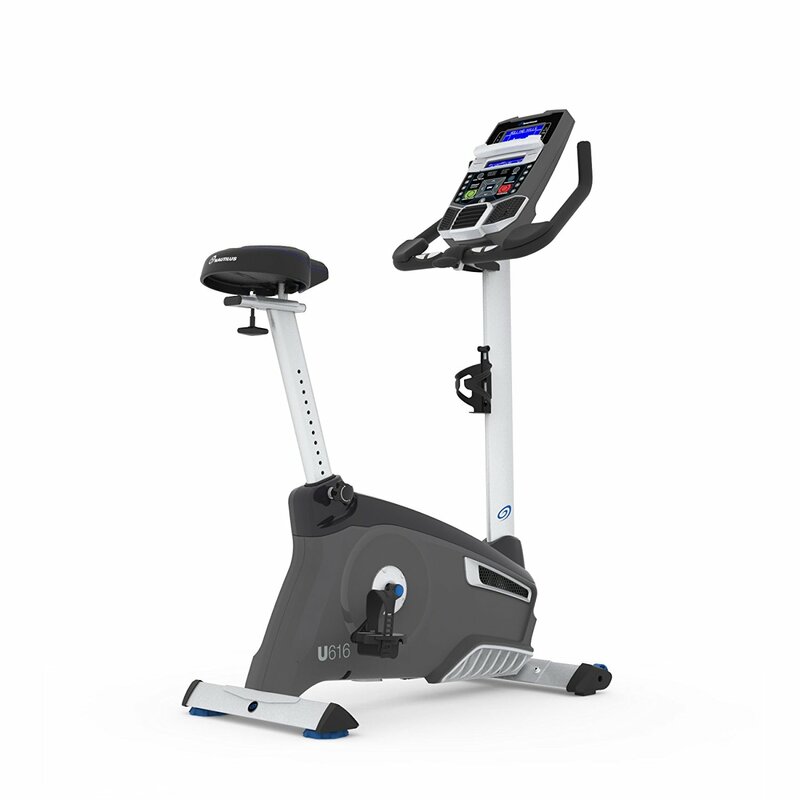 Our reviews showed that you get a large number of solid workout programs, plenty of resistance levels, oversized seat/pedals, bright display and smooth eddy current brakes. Bluetooth workout tracking is a nice feature to have, which makes it a bit more appealing that the base Nautilus U614 model. It doesn't come with a heart rate monitor like the U618, but it has enough to keep you satisfied and motivated to reach your fitness goals, whatever they may be. Whichever Nautilus exercise bike you choose, you'll likely be very satisfied with your purchase as these are fun to use and get you results.